As Steve Schuenke indicated over at his blog, last Friday, we took photos of the lovely Kelly Crabb. Before we started, she indicated that she wanted some “action” shots of her with a little grungy background added-in. Being at the Strand in Galveston, I knew that we had the grungy background, but I was not too sure about the action part. Before I post anything, I want EVERYONE to know that I realize that the focus is somewhat “soft” on the action shots. This is due to a fine combination of stupidity on my part, bad camera technique and not really thinking-out my options before I took the shots—other than that, I did everything perfectly. 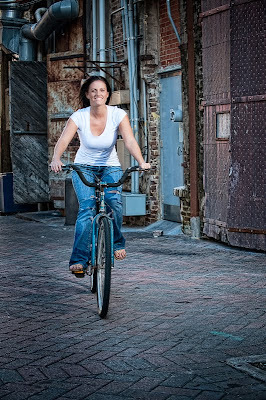 The first shot is of Kelly riding a bike that we hijacked from a kitchen working in the restaurant that we were shooting behind. Overall, the idea was good, but there was a couple of problems with the photo besides the soft focus. I had a Nikon SB-800 on each side of Kelly that produced some shadows across her body. A third SB-800 straight in front of her would have eliminate the shadows—not sure why I didn’t think about adding it during the shooting. By shooting her straight on, I made Kelly look a heavier than she is—not a good decision when you are photographing a young, attractive woman. Camera settings: Nikon D3, Nikon 70-200mm f/2.8 at 200mm, shot at ISO 200, f/6.7 and 1/125th of a second with two Nikon SB-800 on each side of subject set to 1/4th and 1/8th power and triggered by AlienBee radio triggers. Lightroom—Set white and black points, added mid-tone contrast, added overall clarity and vibrance to image and adjusted brightness, clarity. Photoshop—used nik Color Efex Pro tonal contrast to add detail by increasing the contrast in the highlights, mid-tones and shadows. I really like the composition and setting. I like the lighting on Kelly but it seems to me that she is lit too brightly in comparison to the background. It almost looks to me like a studio shot in front of a backdrop. I think a little more ambient light in the lighting ratio might have helped with this? I look forward to seeing other people's comments on the matter! I see what you are trying to do with this photo but like Barry, I would like to see just a little more ambient light. To me, it looks like you have her riding under a street light. I do like how the fall-off in light helps create some nice depth to the photo. Good composition and use of vanishing point to highlight the subject. Nice photo. I think you captured what you want. You seem to be a little harsh on your own work here. I do not see the problems that you see. I think you have explained why the harsh shadow is in the shot. Nuff said about the light as a result. Your point is well taken on the straight on shot also. If you had been standing more at a diagonal it would have helped thin her some. Again you already mentioned that. Grundge background works great here. Nice colors and feel to the shot, outside of your own observations of improving the shot. Good improvisation with finding the "action" for your client. You are very good at giving your client what he/she wants and making something nice out of it. Looking at your lighting of 1/8th and 1/4th power, you might should have used a more one to one ration and raised your lights slightly so that they hit Kelly more on a downward angle. I think that would have reduced the shadows without an additional light. Nice use of the background. Good use of an unique background. It seems to go perfectly with Kelly and what she is doing. The shadows are somewhat bothersome, but not a deal breaker. I am sure you could correct them in Photoshop.